We’ve been making holiday treats and snacks for a couple of weeks now, and we were in the mood for something different. We found DefinitelyDIY’s Christmas Tree Mobiles on Pinterest and thought it would be fun to try! We figured this false tree could be nice for those with allergies, or those who have procrastinated getting a real tree (not us for once, our tree has been up since Thanksgiving!). Or maybe you’re just looking for a fun craft to do with family? First, paint your large lightbulb gold and your small lightbulbs green. Next, you’ll need to make your foam core top. Using a ruler, we measured 5 concentric circles, spaced an inch apart (making the outermost circle have a diameter of 10 inches). Your layers of ornaments will hang from these circles. You can use more or less circles depending on how big you want your tree to be. Cut out your foam core circle, leaving space around the largest circle. Cut another circle of the same size from the foam core and glue them on top of each other. Tie the free end of the fishing wire to the screw-in part of the lightbulb. Hold the other end of the fishing wire up to the foam core (before clipping it from the spool) and eyeball how far down you want the bulb to hang. Once you have the bulb where you want it, attach it by wrapping the fishing wire around a thumbtack at the appropriate length and push the thumbtack into the underside of the foam core. Clip the fishing wire and repeat with the new free end. The larger gold lightbulb will hang from the center of the foam core. Then each circle will hold more and more of the green bulbs. Our first circle had 4 green bulbs, and each circle went up by either two or three bulbs (we just did it by sight). We perched the foam core on two chairs while we were making the mobile to make it easier! All finished! It’s heavier than it looks! 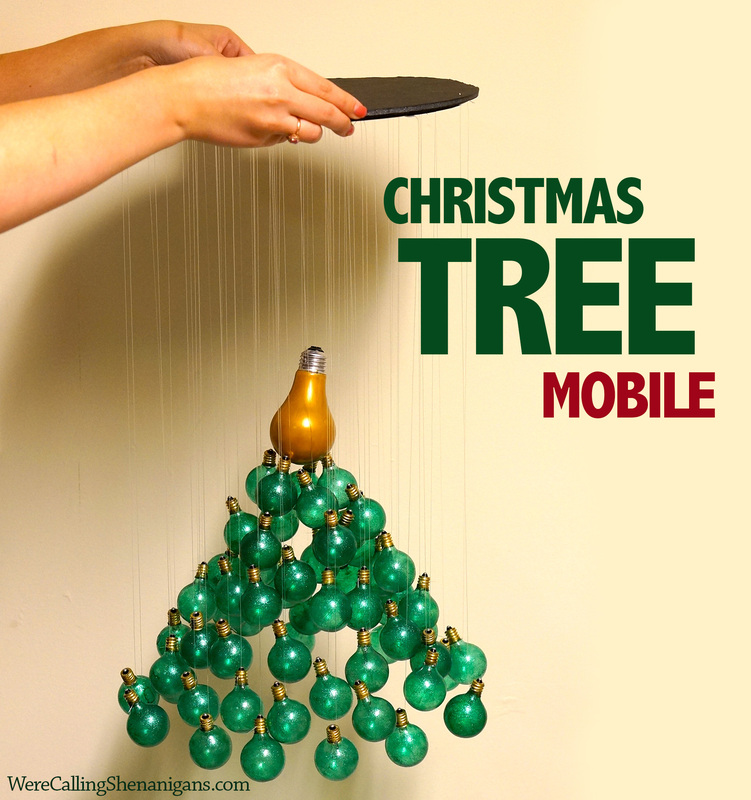 Overall, this Christmas Tree mobile worked out well! It was quite a bit of work doing all that painting and pinning. It took a steady hand, patience, and the better part of the movies 27 Dresses and My Big Fat Greek Wedding to get through this shenanigan. If you’re looking for something quick and easy, this may not be for you. But if you’re willing to put in the work, the result is a beautiful and unique Christmas decoration. Looking for some more holiday shenanigans?